Dawne Goodwin McCullough died at her home in Fallbrook, Calif., on Oct. 14. She had been in failing health. She was the cofounder of the Larchmont Chronicle in 1963 with Jane Gilman. Born and raised in Chicago, she learned her sales ability from her father Dan, and interest in philanthropy from her mother Jo. Dawne saw the Chronicle grow from the initial 12-page newspaper to more than 100 pages during the banner years in the late 1980s. Originally started in the den of Dawne’s house, the newspaper moved to Larchmont Blvd. a year later. Her civic involvement and fundraising ability were impressive. 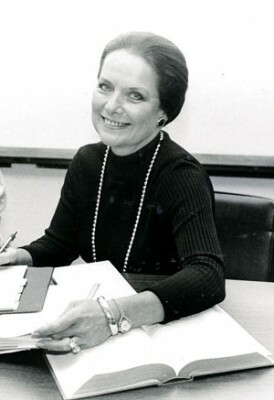 Her initial community participation was with the Wilshire Chamber of Commerce where she was the first woman to serve on its board of directors. Past board chairman of the Hollywood-Wilshire YMCA, she received citywide recognition when she won the YMCA’s Golden Book Award. Her organizational skills were also shared with the Miracle Mile Civic Coalition, the Larchmont Boulevard Assoc., Park Mile Specific Plan, Windsor Square-Hancock Park Historical Society, to name a few. She retired 15 years ago to Fallbrook where she continued her fundraising skills. Predeceased by her husband Mickey McCullough by six months, she is survived by a sister Gail Chambers, daughters Robin Zitko and Wendy Placek, stepson Mickey McCullough Jr., four grandchildren and four great-grandchildren. Donations in her name may be made to the Fallbrook Land Conservancy, 1815 Stagecoach Lane, Fallbrook CA, 92028.